The past two days have been a down pour in several parts of Texas. I cannot and will not complain. We desperately needed the rain. Hopefully the lake levels have increased, our watering restrictions will be lifted and that the grass is happy again. Recovering from a long weekend coupled with dark, drizzly skies, rolling out of bed yesterday morning and getting dressed was tough stuff. I had to muster up all my energy to brave the weather for an appointment. If I had to join the gray and dreary day, I was going to wear nothing less than bright and cheerful attire. Hopefully, my well watered roses growing in the backyard will be as bountiful as my umbrella. I greedily admit, the past two days have been enough. I am ready for clear, sunny skies again. Love a bright cheery outfit for a rainy day. Please send some rain my way, we so desperately need it. Adore this dress!! Wish I looked this adorable in the rain! This may be my favorite ever post you've done - great color combo! I love the rain boots and umbrella! Such cute accessories! Pink and red are the best! I am in love with that dress, pink and red are so pretty together. I need to get out my own cheery look today because the rain started and isn't going away until the weekend. We need it too, so I'm glad. This is the prettiest umbrella! I love how it matches your rain boots. Hope things dry out for you soon! You are gorgeous in pink and red lady :) The umbrella is so cute! Love the vibrant pink and red colors! Such a gorgeous look! What a fun outfit! Loving the bright colors. I love you matching rain accessories! What an adorable dress! Love the bright pink color on you! This dress is so gorgeous on you and these pictures are too cute for words! What an amazing color! I love the combo of the whole outfit, stunning as always! You are WAY too cute!! You totally rock an umbrella and boots!! I love the mix of red and pink here and can we talk about your dress?! It is so cute!!!!!!! Yes! Not sure which part of TX you're in but it's been insanely rainy here in Houston...cute outfit! Your rainboots (and the weather) make me want to go shopping for some! Me oh my aren't you the cutest? That look will certainly drive away any rainy day blues. I hope LA gets its share of rain....it's drought level again here! LOVING these brights for a rainy day! That dress is absolutely adorable on you! Shanna honey you look gorgeous and so girly-pretty in this Red+Pink Ensemble. Your dress, umbrella and especially your wellies are gorgeous. Would love for you to see how I styled my Sandals and Wedges, today. As always a pleasure linking up. I'm with Rebecca...send some of that rain out to CA. Drought conditions are terrible here (I'm impressed that your city has lawn watering restrictions...they really need to do that here.) Anyway, back to fashion. Love the bright pink dress to cheer up a rainy day! I adore that dress. Perfect for those days you just need to throw something on effortlessly. Those boots are awesome, even better then ( can i say it) HUNTERS, good lord I want them. You are the cutest–I'm obsessed with that umbrella! I definitely (definitely) never look this good when it's raining! Very cute dress. Love it with the red boots and purse!!!!! The outfit currently on my blog is also for a rainy day! Gotta look cute while staying dry, right!? I'm sharing my Strawberry Shortcake party today and it just so happens to match your featured outfit today! You make a rainy day look so fun! Thanks for sharing and hosting! this is the cutest umbrella I've ever seen! I've been dying for that dress and so freakin jealous-I'm not going to lie! If it's a size 4 and you want to consider selling it, I am totally serious- I would! Awwwww your outfit definitely brightens up a dreary, rainy day! Absolutely love your umbrella! We've been getting rain around D.C. as well which helps to get rid of the humidity so I'll take it as well haha. 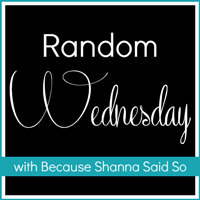 Happy Wednesday Shanna! I have seen endless Instagrams of rain and rainbows from my Texas friends this week! I'm feeling a little iffy about going back to that next week after so much Californian sun :) But Shanna, you're looking so bright and beautiful in these photos - bet you brought many a smile on this rainy day! LOVE the umbrella and banana rain boots! I'm LOVING all the rain - it's FINALLY making it into the lakes!!! This is THE cutest rainy day outfit! Is it weird that I only wear jeans/pants in the rain? Otherwise I feel like my legs get soaked! Kudos to you for your bravery in wearing such fun colors! I wear mostly black and white but really admire those who inject color into their style aesthetic. You look fab! I love the red and pink color combo!! It is one of my favorites to wear! I never thought to pair my red hunters with a pink dress, though! I'm going to have to try it on and see if it works with what I've got! this dress is perfection!! the colors of this whole post- dead! That color of pink is one of my favorites. It looks so pretty on you! Love the red wellies with it. Have a great day! What a gorgeous color combo! Definitely a fun way to beat the gloomy weather! Loving those red boots!! Look at you cutie pie! Love this! Perfect rainy day outfit. LOVE the boots and that cute umbrella! This is so pretty. I will be so happy in the rain with this look! Perfect! Love love love your boots!!! So fun! Love the red wellies with zipper detail! So cute! What a pretty look to brighten up a rainy day!! Too cute and love how your umbrella matches too. I just love pink and red together. This dress is so cute and the boots are perfect. Oh gosh, aren't you a breath of fresh air?! LOVE this fun outfit! And the dress is literally perfect. I am SO into smock dresses lately!! 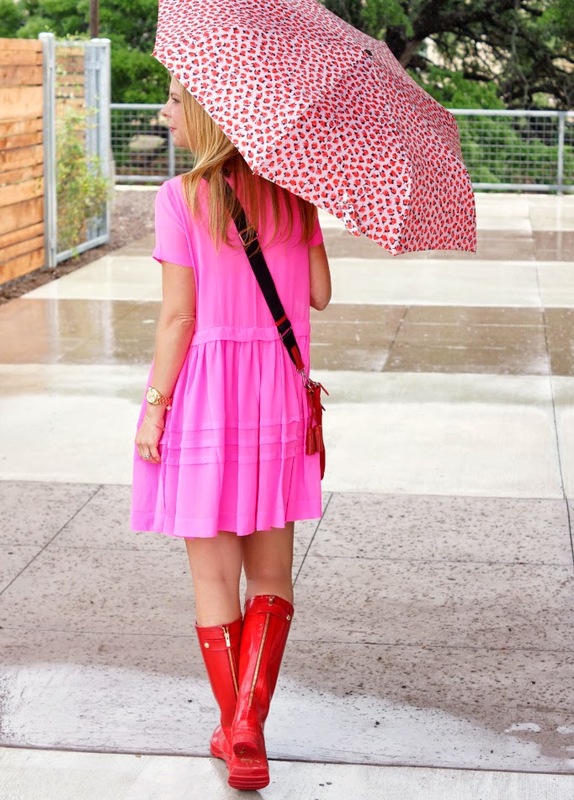 Love your pink dress, and those adorable red rainboots. Love this color combination. Your umbrella is perfect by the way.Such a great outfit. So pretty. I absolutely love this! You are so cute! Such a cute dress! And I love the red and pink combo! I have to say love in a weird way. It's coming.. I LURVE that umbrella. There, I got it out of my system.